Prof. Reijmer received his B.Sc. and M.Sc. in Stratigraphy / Sedimentology from the University of Amsterdam, The Netherlands in 1984. He then received his Ph.D. from the Vrije Universiteit in Amsterdam, The Netherlands. He completed his Habilitation at the Christian-Albrechts-University in Kiel, Germany. He moved to Germany in 1992, to the GEOMAR Marine Research Institute in Kiel (Northern Germany near Denmark) where his research focused on present-day carbonate systems in the Gulf of Aqaba and the Gulf of Panamá to Carboniferous (Spain), Jurassic (Morocco) and Miocene (Egypt) carbonate platform systems. After several years at GEOMAR, he accepted a Full Professorship in Carbonate Sedimentology in Marseille in 2005 at the Université de Provence, where he worked with Cretaceous calcidebrites and calciturbidites as well as cool-water carbonates. 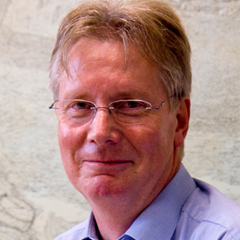 He moved back to the Netherlands in 2007 to accept a Full Professorship in Carbonate Sedimentology and Marine Geology in his hometown of Amsterdam with the Vrije Universiteit Amsterdam. He also occupied a part-time professorship at Delft University of Technology for six years. In 2014 he visited the TOTAL Research Laboratory in Pau (France) for an 8-month sabbatical. Late 2016 John transferred to the College of Petroleum Engineering and Geosciences (CPG) of the King Fahd University of Petroleum and Minerals (KFUPM) in Dhahran (Kingdom of Saudi Arabia) to accept the Saudi Aramco Chair in Geosciences. He remains associated with the Vrije Universiteit Amsterdam (The Netherlands). DSc (Habilitation) from the Christian-Albrechts-University in Kiel, Germany. Ph.D. from the Vrije Universiteit in Amsterdam, The Netherlands. Carbonate platform development, paleoceanography and sequence stratigraphy, Cycle development within carbonate sedimentary environments, Carbonate platform slopes, Petrophysics of non-marine and marine carbonates and mixed carbonate/siliciclastic systems, and Fracture development in carbonates. His Google Scholar H-Index score is 28, his i10-index is 71, and he has over 2,550 citations. Reijmer advisee: *** = MSc student; ** = PhD student; * = Post-Doctoral Scholar. Michel, J. *, Borgomano, J. and Reijmer, J.J.G. (2018). Heterozoan carbonates: when, where and why? – A synthesis on parameters controlling carbonate production and occurrences. Earth Science Reviews, 182, 50-67. DOI: 10.1016/j.earscirev.2018.05.003. Lüdmann, T., Betzler, C., Eberli, G.P., Reolid, J., Reijmer, J.J.G., Sloss, C.R., Bialik, O.M., Alvarez-Zarikian, C.A., Alonso-García, M., Blättler, C.L., Guo, J.A., Haffen, S., Horozal, S., Inoue, M., Jovane, L., Kroon, D., Lanci, L., Laya, J.C., Ling, A.H.M., Nakakuni, M., Nath, B.N., Niino, K., Petruny, L.M., Pratiwi, S.D., Slagle, A.L., Su, X., Swart, P.K., Wright, J.D., Yao, Z. and Young, J.R. (2018.). Carbonate delta drift: A new sediment drift type. Marine Geology, 401, 98-111. DOI: 10.1016/j.margeo.2018.04.011. Jafarian, E.**, de Jong, K.***, Kleipool, L.M. **, Scheibner, C., Blomeier, D. and Reijmer, J.J.G. (2018). Synthetic seismic model of a Permian biosiliceous carbonate – carbonate depositional system (Spitsbergen, Svalbard Archipelago). Marine and Petroleum Geology, 92, 78-93. DOI: 10.1016/j.marpetgeo.2018.01.034. Betzler, C., Eberli, G.P., Lüdmann, T., Reolid, J., Kroon, D., Reijmer, J.J.G., Swart, P.K., Wright, J.D., Alvarez-Zarikian, C.A., Alonso-García, M., Bialik, O.M., Blättler, C.L., Guo, J.A., Haffen, S., Horozal, S., Inoue, M., Jovane, L., Lanci, L., Laya, J.C., Hui Mee, A.L., Nakakuni, M., Nath, B.N., Niino, K., Petruny, L.M., Pratiwi, S.D., Slagle, A.L., Sloss, C.R., Su, X., Yao, Z. and Young, J.R. (2018). Refinement of Miocene sea level and monsoon events from the sedimentary archive of the Maldives (Indian Ocean). Progress in Earth and Planetary Science, 2018 5:5. DOI: 10.1186/s40645-018-0165-x. Nooitgedacht, C.W. ***, Kleipool, L.M. **, Andeweg, B., Réolid, L.M., Betzler, C., Lindhorst, S. and Reijmer, J.J.G. (2018). New insights in the development of syn-depositional fractures in rimmed flat-topped carbonate platforms, Neogene carbonate complexes, SE Spain. Basin Research, 30 (Suppl. 1), 596–612. DOI: 10.1111/bre.12239. Wunsch, M., Betzler, C., Eberli, G.P., Lüdmann, T., Lindhorst, S. and Reijmer, J.J.G. (2018). Sedimentary dynamics and high-frequency sequence stratigraphy of the southwestern slope of Great Bahama Bank. Sedimentary Geology, 363, 96-117. DOI: 10.1016/j.sedgeo.2017.10.013. Mulder, T., Gillet, H., Hanquiez, V., Ducassou, E., Principaud, M., Conesa, G., Le Goff, J. *, Ragusa, J., Bashah, S., Reijmer, J., Cavailhes T., Droxler, A., Blank, D., Guiastrennec L., Fabregas, N. and Recouvreur, A. (2018). Carbonate slope morphology revealing a giant submarine canyon (Little Bahama Bank, Bahamas). Geology, 46, 31-34. DOI: 10.1130/G39527.1. Jafarian, E.**, Groen, R.***, Nooitgedacht, C.**, Scheibner, C., Blomeier, D. and Reijmer, J.J.G. (2017). Facies arrangement and cyclostratigraphic architecture of the Templet Member and the Kapp Starostin Formation (Permian) on Spitsbergen, Svalbard. Norwegian Journal of Geology, 97, 169–187. DOI: 10.17850/njg97-4-02. Reijmer, J.J.G., Ten Veen, J., Jaarsma, B. and Boots, R.*** (2017). Seismic stratigraphy of Dinantian carbonates in the southern Netherlands and northern Belgium. Netherlands Journal of Geosciences, 96/4 (December 2017), 353-379. DOI: 10.1017/njg.2017.33. Bertotti, G., de Graaf, S.**, Bisdom, K., Oskam B., Vonhof, H., Bezerra, F.H., Reijmer, J. and Cazarin, C. (2017). Fracturing and fluid flow during post-rift subsidence in carbonates of the Jandaíra Formation, Potiguar Basin, NE Brazil. Basin Research, 29, 836–853. DOI: 10.1111/bre.12246. Mercedes-Martín, R.*, Brasier, A.T., Rogerson, M., Reijmer, J.J.G., Vonhof, H. and Pedley, H.M. (2017). A depositional model for spherulitic carbonates associated with alkaline, volcanic lakes. Marine and Petroleum Geology, 86, 168-191. DOI: 10.1016/j.marpetgeo.2017.05.032. Kleipool, L.M. **, De Jong, K.***, De Vaal, E.*** and Reijmer, J.J.G. (2017). Seismic characterization of switching platform geometries and dominant carbonate producers (Miocene, Las Negras, Spain). Sedimentology, 64, 1676–1707. DOI: 10.1111/sed.12367. Rogerson, M., Mercedes-Martín, R.*, Brasier, A.T., McGill, R.A.R., Prior, T.J., Vonhof, H., Fellows, S.M., Reijmer, J.J.G., McClymont, E., Billing, I., Matthews, A. and Pedley, M. (2017). Are spherulitic lacustrine carbonates an expression of large-scale mineral carbonation? A case study from the East Kirkton Limestone, Scotland. Gondwana Research, 48, 101-109, DOI: 10.1016/j.gr.2017.04.007. Mulder, T., Joumes, M., Hanquiez, V., Gillet, H., Reijmer, J.J.G., Tournadour, E., Chabaud, L.**, Principaud, M., Schnyder, J.S.D., Borgomano, J., Fauquembergue, K., Ducassou, E. and Busson, J. (2017). Carbonate slope morphology revealing sediment transfer from bank-to-slope transfer (Little Bahama Bank, Bahamas). Marine and Petroleum Geology, 83, 26-34. DOI: 10.1016/j.marpetgeo.2017.03.002. Jafarian, E.**, Kleipool, L.M. **, Scheibner, C. Blomeier, D. and Reijmer, J.J.G. (2017). Variations in petrophysical properties of Upper Palaeozoic mixed carbonate and non-carbonate deposits, Spitsbergen, Svalbard Archipelago. Journal of Petroleum Geology, 40, 59-83. DOI: 10.1111/jpg.12664. de Graaf, S.**, Reijmer, J.J.G., Bertotti, G.V., Bezerra, F.H.R., Cazarin, C., Bisdom, K. and Vonhof, H.B. (2017). Fracturing and calcite cementation controlling fluid flow in the shallow-water carbonates of the Jandaíra Formation, Brazil. Marine and Petroleum Geology, 80, 382-393. DOI: 10.1016/j.marpetgeo.2016.12.014. Reijmer, J.J.G. (2016). Carbonate factories. In: J. Harff, M. Meschede, S. Petersen, J. Thiede (Eds. ), Encyclopedia of Marine Geosciences, p. 80-84. ISBN: 978-94-007-6237-4 (Print), 978-94-007-6238-1 (Online). DOI: 10.1007/978-94-007-6644-0_136-1. Betzler, C. and IODP Expedition 359 Scientists (incl. J.J.G. Reijmer) (2016). The abrupt onset of the modern South Asian Monsoon winds. Nature – Scientific Reports 6, 29838. DOI: 10.1038/srep29838. Chabaud, L.**., Ducassou, E., Tournadour, E., Mulder, T., Reijmer, J.J.G., Conesa, G., Giraudeau, J., Hanquiez, V., Borgomano, J. and Ross, L. (2016). Sedimentary processes determining the modern carbonate periplatform drift of Little Bahama Bank. Marine Geology, 378, 213-229. DOI: 10.1016/j.margeo.2015.11.006. Mercedes-Martín, R.*, Rogerson, M.R., Brasier, A.T., Vonhof, H.B., Prior, T., Fellows, S.M., Reijmer, J.J.G., Billing, I. and Pedley, H.M. (2015, subm.). Growing spherulitic calcite grains in saline, hyperalkaline lakes: Experimental evaluation of the effects of Mg-clays and organic acids. Sedimentary Geology, 335, 93-102. DOI: 10.1016/J.SEDGEO.2016.02.008. Soete, J., Kleipool, L.M. **, Claes, H., Claes, S., Hamaekers, H., Kele, S., Özkul, M., Foubert, A., Reijmer, J.J.G. and Swennen, R. (2015). Acoustic properties in travertines and their relation to porosity and pore types. Marine and Petroleum Geology, 59, 320-335. Swart, P.K., Oehlert, A., Mackenzie, G.J., Eberli, G.P. and Reijmer, J.J.G. (2014). The fertilization of the Bahamas by Saharan dust: A trigger for carbonate precipitation? Geology, 42, 671-674. DOI: 10.1130/G35744.1. Fournier, F., Léonide, P., Kleipool, L.**, Toullec, R., Reijmer, J.J.G., Borgomano, J., Klootwijk, T. and van der Molen, J. (2014). Pore space evolution and elastic properties of platform carbonates (Urgonian Limestone, Barremian-Aptian, SE France). Sedimentary Geology, 308, 1-17. Léonide, P., Fournier, F., Reijmer, J.J.G., Vonhof, H.B., Borgomano, J., Dijk, J., Rosenthal, M., van Goethem, M., Cochard, J., and Meulenaars, K. (2014). Diagenetic patterns and pore space distribution along a platform to outer-shelf transect (Urgonian Limestone, Barremian-Aptian, SE France). Sedimentary Geology, 306, 1-23. Betzler, C. and cruise participants (2014). Report and preliminary results of R/V Meteor cruise M95 CICARB – Current Impact on the Facies and Stratigraphy of the Bahamas Carbonate Platform. METEOR-Berichte, M95, 36 pp., DFG-Senatskommission für Ozeanographie. DOI: 10.2312/cr_m95. van der Land, C.**, Eisele, M., Mienis, F., de Haas, H., Hebbeln, D., Reijmer, J.J.G. and van Weering, T.C.E. (2014). Carbonate mound development in contrasting settings on the Irish margin. Deep-Sea Research Part II, 99, 297-306. Betzler, C., Fürstenau, J, Lüdmann. T., Hübscher C., Lindhorst. S., Paul, A. **, Reijmer, J.J.G. and Droxler, A.W. (2013). Sea-level and ocean-current control on carbonate-platform growth, Maldives, Indian Ocean. Basin Research, 25, 172-196. DOI: 10.1111/j.1365-2117.2012.00554.x. Cleroux, C., Debret, M., Cortijo, E., Duplessy, J.-C., Dewilde, F., Reijmer, J.J.G. and Massei, N. (2012). High-resolution sea surface reconstructions off Cape Hatteras over the last 10 ka. Paleoceanography, 27, PA1205. DOI: 10.1029/2011PA002184. Mulder, T., Ducassou, E., Gillet, H., Hanquiez, V., Tournadour, E., Combes, J., Eberli, G.P., Kindler, P., Gonthier, E., Conesa, G., Robin, C., Sianipar, R., Reijmer, J.J.G. and François, A. (2012b). Canyon morphology on a modern carbonate slope of the Bahamas: Evidence of regional tectonic tilting. Geology, 40/9, 771-774. Mulder, T., Ducassou, E., Eberli, G.P., Hanquiez, V., Gonthier, E., Kindler, P., Principaud, M., Fournier, F., Léonide, P., Billeaud, I., Marsset, B., Reijmer, J.J.G., Bondu, C., Joussiaume, R. and Pakiades, M. (2012a). New insights into the morphology and sedimentary processes along the western slope of Great Bahama Bank. Geology, 40/7, 603-606. Reijmer, J.J.G., Palmieri, P.*** and Groen, R.*** (2012). Compositional variations in calciturbidites and calcidebrites in response to sea-level fluctuations (Exuma Sound, Bahamas). Facies, 58/4, 493-507. Oehlert, A., Lamb-Wozniak, K., Devlin, Q., Reijmer, J.J.G., Mackenzie, G.J. and Swart, P.K. (2012). The Significance of Variations in the Stable Carbon Isotopic Composition of Organic Material in Platform Derived Sediments. Sedimentology, 59, 319–335. DOI: 10.1111/j.1365-3091.2011.01273.x. Piryaei, A. **, Reijmer, J.J.G., Borgomano, J., and van Buchem, F. (2011). Late Cretaceous tectonic and sedimentary evolution of the Bandar Abbas area, Fars Region, Southern Iran. Journal of Petroleum Geology, 34/2, 157-180. Schäfer, P., Fortunato, H., Bader, B., Liebetrau, V., Bauch, T.** and Reijmer, J.J.G. (2011). Growth Rates and Carbonate Production by Coralline Red Algae in Upwelling and Non- Upwelling Settings along the Pacific Coast of Panama. Palaios, 26/7, 420-432.
van der Land, C.**, Mienis, F., de Haas, H., de Stigter, H., Swennen, R., Reijmer, J.J.G. and van Weering, T. (2011). Paleo-redox fronts and their formation in carbonate mound sediments from the Rockall Trough. Marine Geology, 284 (1-4, 1 June 2011), 86-95. Vonhof, H.B., Jagt, J., Immenhauser, A., Smit, J., van de Berg, Y., Saher, M., Keutgen, N. and Reijmer, J.J.G. (2011). Belemnite-based strontium, carbon and oxygen isotope stratigraphy of the type area of the Maastrichtian Stage. In: J. Jagt, E.A. Jagt-Yazykova and W.J.H. Schins (Eds. ), A tribute to the late Felder brothers – pioneers of Limburg geology and prehistoric archaeology. Netherlands Journal of Geosciences, 90/2-3, 259-270. Vernhet, E. and Reijmer, J.J.G. (2010). Sedimentary evolution of the Ediacaran Yangtze platform shelf (Hubei and Hunan provinces, Central China). Sedimentary Geology, 225, 99-115. Betzler, C., Hübscher, C., Lindhorst, S., Reijmer, J.J.G., Römer, M., Droxler, A.W., Fürstenau, J. and Lüdmann, T. (2009). Monsoonal-induced partial carbonate platform drowning (Maldives, Indian Ocean). Geology, 37, 867-870. Schlager, W. and Reijmer, J.J.G. (2009). Carbonate platform slopes of the Alpine Triassic and the Neogene – a comparison. Austrian Journal.of Earth Sciences, 102, 4-14. Swart, P.K., Reijmer, J.J.G. and Otto, R. (2009). A reevaluation of facies on Great Bahama Bank II: Variations in the d13C, d18O, and mineralogy of surface sediments. In: P.K. Swart, G.P. Eberli, J.A. McKenzie (Eds. ), Perspectives in Carbonate Geology: A Tribute to the Career of Robert Nathan Ginsburg. Spec. Publ. Int. Assoc. Sedimentol., 41, 47–59. Reijmer, J.J.G., Swart, P.K, Bauch, T.***, Otto, R., Reuning, L.**, Roth, S.** and Zechel, S.*** (2009). A reevaluation of facies on Great Bahama Bank I: New facies maps of Western Great Bahama Bank. In: P.K. Swart, G.P. Eberli, J.A. McKenzie (Eds. ), Perspectives in Carbonate Geology: A Tribute to the Career of Robert Nathan Ginsburg. Spec. Publ. Int. Assoc. Sedimentol., 41, 29–46. Chazottes, V., Reijmer, J.J.G. and Cordier, E. (2008). Sediment characteristics in reef areas influenced by eutrophication-related alterations of benthic communities and bioerosion processes. Marine Geology, 250, 114-127. Lantzsch, H.***, Roth, S.**, Reijmer, J.J.G. and Kinkel, H. (2007). Sea-level related resedimentation processes on the northern slope of Little Bahama Bank (Middle Pleistocene to Holocene). Sedimentology, 54, 1307-1322. Reijmer, J.J.G. and Andresen, N.** (2007). Mineralogy and grain-size variations along two carbonate margin-to-basin transects (Pedro Bank, Northern Nicaragua Rise). Sedimentary Geology, 198, 327-350. Reuning, L.**, Reijmer, J.J.G., Betzler, C., Timmermann, A. and Steph, S. (2006). Sub-Milankovitch cycles in periplatform carbonates from the early Pliocene Great Bahama Bank. Paleoceanography, 21/3, PA1017 10.1029/2004PA001075, 30 March 2006. Reuning, L.**, Reijmer, J.J.G. and Mattioli, E. (2006). Aragonite cycles: Diagenesis caught in the act. Sedimentology, 53, 849–866. Ernst, A., Schäfer, P. and Reijmer, J.J.G. (2005). Stenolaemate Bryozoa from the Upper Carboniferous of the Cantabrian Basin, Northern Spain. Senckenbergiana lethea, 85, 301-317. Roth, S.** and Reijmer, J.J.G. (2005). Holocene millennial to centennial carbonate cyclicity recorded in slope sediments of the Great Bahama Bank and its climatic implications. Sedimentology, 52, 161-181. Reijmer, J.J.G. and Immenhauser, A. (2005). Sedimentary Geology Special Issue “Sedimentology in the 21st Century – A Tribute to Wolfgang Schlager”, Editorial. Sedimentary Geology, 175, 3-8. Rendle-Bühring, R.H.** and Reijmer, J.J.G. (2005). Controls on grain-size patterns in periplatform carbonates: marginal setting versus glacio-eustacy. Sedimentary Geology Special Issue “Sedimentology in the 21st Century – A Tribute to Wolfgang Schlager“, 175, 99-113. Reuning, L.**, Reijmer, J.J.G., Betzler, C., Swart, P.K. and Bauch, T.*** (2005). The use of paleoceanographic proxies in carbonate platform settings – opportunities and pitfalls. Sedimentary Geology Special Issue “Sedimentology in the 21st Century – A Tribute to Wolfgang Schlager“. 175, 131-152. Zinke, J. **, Reijmer, J.J.G., Taviani, M., Dullo, W.-C. and Thomassin, B. A. (2005). Facies and faunal assemblage changes in response to the Holocene transgression in the lagoon of Mayotte (Comoro Archipelago, SW Indian Ocean). Facies, 50/3-4, 391-408. Bahamonde, J.R., Kenter, J.A.M., Della Porta, G., Keim, L., Immenhauser, A. and Reijmer, J.J.G. (2004). Lithofacies and depositional processes on a high, steep-margined Carboniferous (Bashkirian-Moscovian) carbonate platform slope, Sierra del Cuera, NW Spain. Sedimentary Geology, 166, 1/2, 145-156. Roth, S.** and Reijmer, J.J.G. (2004). Holocene Atlantic climate variations deduced from carbonate peri-platform sediments (leeward margin, Great Bahama Bank). Paleoceanography, 19/1, PA1003 10.1029/2003PA000885, 22 January 2004. Schmittner, A., Sarnthein, M., Kinkel, H., Bartoli, G., Bickert, R., Crucifix, M., Crudeli, D., Groeneveld, J., Kösters, F., Mikolajewicz, U., Millo, C., Reijmer, J., Schäfer, P., Schmidt, D., Schneider, B., Schulz, M., Steph, S.. Tiedemann, R., Weinelt, M. and Zuvela, M. (2004). Global impact of the Panamanian Seaway. EOS 85-49, 526-527. Andresen, N.**, Reijmer, J.J.G. and Droxler, A.W. (2003). Timing and distribution of calciturbidites around a deeply submerged carbonate platform in a seismically active setting (Pedro Bank, Northern Nicaragua Rise, Caribbean Sea). Int. J. of Earth Sc. – Geol. Rundschau, 92/4, 573-592. Brachert, T.C., Forst, M.H., Pais, J.J., Legoinha, P. and Reijmer, J.J.G. (2003). Lowstand carbonates, highstand sandstones? Sedimentary Geology, 155, 1-12. Maurer, F., Reijmer, J.J.G. and Schlager, W. (2003). Quantification of input and compositional variations of calciturbidites in a Middle Triassic pelagic succession (Seceda, Western Dolomites, Southern Alps). Int. J. of Earth Sc. – Geol. Rundschau, 92/4, 593-609. Reijmer, J.J.G., Betzler, C. and Mutti, M. (2003). DGG & GV 2001 MARGINS Meeting (Kiel, Germany) – New perspectives in carbonate sedimentology (Editorial). Int. J. of Earth Sc. – Geol. Rundschau, 92/4, 441-444. Scheibner, C., Reijmer, J.J.G., Marzouk, A.M., Speijer, R.P. and Kuss, J. (2003). Tectono-sedimentary evolution of a Paleogene carbonate margin (Eastern Desert, Egypt). Int. J. of Earth Sc. – Geol. Rundschau, 92/4, 624-640. Zinke, J. **, Reijmer, J.J.G., Thomassin, B.A., Dullo, W.C., Grootes, P.M. and Erlenkeuser, H. (2003). Postglacial flooding history of Mayotte lagoon (Comoro archipelago, southwest Indian Ocean). Marine Geology, 194, 181-196. Zinke, J. **, Reijmer, J.J.G. and Thomassin, B.A. (2003). Systems tracts sedimentology in the lagoon of Mayotte associated with the Holocene transgression. Sedimentary Geology, 160, 57-79. Blomeier, D.P.G. ** and Reijmer, J.J.G. (2002). Facies architecture of an Early Jurassic carbonate platform slope (Jbel Bou Dahar, High Atlas, Morocco). Journal of Sedimentary Research, 72/4, 463-476. Reijmer, J.J.G., Betzler, C., Kroon D., Tiedemann, R. and Eberli, G.P. (2002). Bahamian carbonate platform development in response to paleoceanographic changes. International Journal of Earth Sciences – Geologische Rundschau, 91, 482-489. Reijmer, J.J.G. (2002). Introduction – PRCP/ODP Leg 166 special issue “Carbonate margin development (Bahama Transect, ODP Leg 166)”. In: Reijmer, J.J.G. (Ed. ), Marine Geology special issue “Carbonate margin development (Bahama transect, ODP Leg 166)”, 185, vii-xii. Rendle, R.H.** and Reijmer, J.J.G. (2002). Evolutionary slope development on the western, leeward margin of Great Bahama Bank during the Quaternary. In: Reijmer, J.J.G. (Ed. ), Marine Geology special issue “Carbonate margin development (Bahama transect, ODP Leg 166)”, 185, 143-164. Reuning, L.**, Reijmer, J.J.G. and Betzler, C. (2002). Sedimentation cycles and their diagenesis on the slope of a Miocene carbonate ramp system (Bahamas, ODP Leg 166). In: Reijmer, J.J.G. (Ed. ), Marine Geology special issue “Carbonate margin development (Bahama transect, ODP Leg 166)”, 185, 121-142. Munnecke, A., Westphal, H.**, Elrick, M. and Reijmer, J.J.G. (2001). The mineralogical composition of precursor sediments of calcareous rhythmites: a new approach. International Journal of Earth Sciences – Geologische Rundschau, 90, 795-812. Zinke, J. **, Reijmer, J.J.G. and Thomassin, B.A. (2001). Seismic architecture and sediment distribution within the Holocene barrier reef-lagoon complex of Mayotte (Comoro Archipelago, SW Indian Ocean). In: Camoin, G. (Ed. ), Palaeo-3 special volume “PRCP Conference”, 175, 343-368. Betzler, C., Kroon, D. and Reijmer, J.J.G. (2000). Synchroneity of major late Neogene sea-level fluctuations and paleoceanographic controlled changes as recorded by two carbonate platforms. Paleoceanography, 15/6, 722-730. Henderson, G.M., Rendle, R.H.**, Slowey, N.C. and Reijmer, J.J.G. (2000). U-Th dating and diagenesis of Pleistocene highstand sediments from the Bahamas slope. In: Swart, P.K., Eberli, G.P., Malone, M.J. and Sarg, J.F. (Eds. ), Proceedings of the Ocean Drilling Program, Scientific Results, 166, 23-31. Kroon, D., Reijmer, J.J.G. and Rendle, R.H.** (2000). Mid- to Late-Quaternary variations in the oxygen isotope signature of Globigerinoides ruber at Site 1006 in the western subtropical Atlantic. In: Swart, P.K., Eberli, G.P., Malone, M.J. and Sarg, J.F. (Eds. ), Proceedings of the Ocean Drilling Program, Scientific Results, 166, 13-22. Rendle, R.H.**, Reijmer, J.J.G., Kroon, D. and Henderson, G.M. (2000). Mineralogy and sedimentology of the Pleistocene to Holocene on the leeward margin of Great Bahama Bank. In: Swart, P.K., Eberli, G.P., Malone, M.J. and Sarg, J.F. (Eds. ), Proceedings of the Ocean Drilling Program, Scientific Results, 166, 61-76. Zinke, J. **, Reijmer, J.J.G., Dullo, W.-C. and Thomassin, B.A. (2000). Paleoenvironmental changes in the lagoon of Mayotte associated with the Holocene transgression. GeoLines, 11, 150-153. Pages 2000, Prague Meeting. Betzler, C., Reijmer, J.J.G., Bernet, K., Eberli, G.P. and Anselmetti, F.S. (1999). Sedimentary patterns and geometries of the Bahamian outer carbonate ramp (Miocene and lower Pliocene, Great Bahama Bank). Sedimentology, 46/6, 1127-1144. Blomeier, D.P.G. ** and Reijmer, J.J.G. (1999). Drowning of a Lower Jurassic carbonate platform: Jbel Bou Dahar, High Atlas, Morocco. Facies, 41, 81-110. Everts, A.J.W., Schlager, W. and Reijmer, J.J.G. (1999). Quantitative logs of sediment composition – a means for platform-to-basin correlation in carbonates. An example from the Vercors (France). Sedimentology, 46/2, 261-278. Emmermann, P.P. **, Reijmer, J.J.G. and Andresen, N.** (1999). Sedimentation rates of Late Quaternary periplatform sediments based on aragonite/calcite ratios: Sudanese Red Sea vs. Pedro Bank (Caribbean). In: Bruns, P. and Hass, H.C. (Eds. ), On the determination of sediment accumulation rates, Trans Tech Publications, Switzerland, GeoResearch Forum, 5, 67-86. Heiss, G.A., Dullo, W.-C., Joachimski, M.M., Reijmer, J.J.G. and Schuhmacher, H. (1999). Increased seasonality in the Gulf of Aqaba, Red Sea, recorded in the oxygen isotope record of a Porites lutea coral. Senck. maritima, 30, 17-26. Scheibner, C.*** and Reijmer, J.J.G. (1999). Facies patterns within a Lower Jurassic upper slope to inner platform transect (Jbel Bou Dahar, Morocco). Facies, 41, 55-80. Westphal, H.**, Reijmer, J.J.G. and Head, M.J. (1999). Sedimentary input and diagenesis on a carbonate slope (Bahamas): response to morphologic evolution of the carbonate platform and sea level fluctuations. In: Harris, P.M., Saller, A.H. and Simo, T. (Eds. ), Advances in carbonate sequence stratigraphy – Application to reservoirs, outcrops, and models, SEPM Spec. Publ. 63, SEPM (Society for Sedimentary Geology), 247-274. Reijmer, J.J.G. (1998). Compositional variations during phases of progradation and retrogradation of a Triassic carbonate platform (Picco di Vallandro/Dürrenstein, Dolomites, Italy). Geologische Rundschau, 87/3, 436-448. Dullo, W.-C., Reijmer, J.J.G., Andresen, N.** and Emmermann, P.** (1997). Meeresspiegel-schwan-kungen und ihre geologische Überlieferung im Karbonatsystem. Geowissenschaften, 15/9, 296-300. Eberli, G.P., Swart, P., et al. (incl. Reijmer, J.J.G.) (1997). Proc. ODP, Init. Repts., 166, College Station, TX (Ocean Drilling Program). Munnecke, A., Westphal, H.**, Reijmer, J.J.G. and Samtleben, C. (1997). The formation of microspar during early marine burial diagenesis: a comparison of Pliocene carbonates from the Bahamas with Silurian limestones from Gotland (Sweden). Sedimentology, 44/6, 977-990. Dullo, W.-C., Reijmer, J.J.G., Schuhmacher, H., Eisenhauer, A., Hassan, M. and Heiss, G.A. (1996). Holocene reef growth and recent carbonate production in the Red Sea. In: Reitner, J., Neuweiler, F. and Gunkel, F. (Eds), Global and regional controls on biogenic sedimentation. I. Reef evolution. Research reports – Göttinger Arbeiten zur Geologie und Paläontologie, Göttingen, Sb 2, 13-17. Emmermann, P.**, Reijmer, J.J.G. and Brachert, Th. (1996). Research programme M31/2: Export of shallow water carbonates. In: Hemleben Ch., Roether, W. and Stoffers, P. (Eds), Östliches Mittelmeer, Rotes Meer, Arabisches Meer – Cruise No. 31, 30 December 1994 – 22 March 1995. METEOR-Berichte, Universität Hamburg, 96-4, 13-16. Emmermann, P.**, Reijmer, J.J.G. and Brachert, Th. (1996). Preliminary results – Marine Geoscience: Export of shallow water carbonates. In: Hemleben, Ch., Roether, W. and Stoffers, P. (Eds), Östliches Mittelmeer, Rotes Meer, Arabisches Meer – Cruise No. 31, 30 December 1994 – 22 March 1995. METEOR-Berichte, Universität Hamburg, 96–4, 99-110. Everts, A.J.W. and Reijmer, J.J.G. (1995). Clinoform composition and margin geometries of a Lower Cretaceous carbonate platform (Vercors, SE France). In: Philip, J. and Skelton, P.W. (Eds. ), Thematic volume “ Palaeoenvironmental models for the benthic associations of Cretaceous carbonate platforms”, CRER Working Group 4. Palaeogeogr., Palaeoclimat., Palaeoecol., 119, 19-33. Schuhmacher, H., Kiene, W., Dullo, W.-Chr., Gektidis, M., Golubic, S., Heiss, G.A., Kampmann, H., Kroll, D.K., Kuhrau, M.L., Radtke, G., Reijmer, J.J.G., Reinicke, G.B., Schlichter, D. and Vogel, K. (1995). Facies controlling Holocene reef growth: an interdisciplinary approach. Facies, 32, 145-188. Reijmer, J.J.G., Sprenger, A., Ten Kate, W.G.H.Z., Schlager, W. and Krystyn, L. (1994). Periodicities in the composition of Late Triassic calciturbidites (Eastern Alps, Austria). In: De Boer, P.L. and Smith D.G. (Eds. ), Orbital forcing and cyclic sequences, Spec. Publ. Int. Assoc. Sedimentol., 19, p. 323-343. Schlager, W., Reijmer, J.J.G. and Droxler, A.W. (1994). Highstand shedding of carbonate platforms. Journal of Sedimentary Petrology, B64/3, 270-281. Gasperini, L., Gensou, B., Philobbos, E., Purser, B., Reijmer, J.J.G., Rioual, M., Taviani, M. and Tesson, M. (1994). Gulf of Suez seismic survey (Sept./Oct. 1992): A scientific report. Giornale di Geologia, Ser. 3-a, 56/2: 3-12. Heiss, G., Dullo, W.-Ch. and Reijmer, J.J.G. (1993). Short- and long-term growth history of massive Porites sp. from Aqaba (Red Sea). Senckenbergiana maritima, 23, 135-141. Reijmer, J.J.G., Schlager, W. Bosscher, H., Beets, C.J. and McNeill, D.F. (1992). Pliocene/Pleistocene platform facies transition recorded in calciturbidites (Exuma Sound, Bahamas). Sedimentary Geology, ExpresSed, 78, 171-179. Campbell, A.E., Everts, A.J.W. and Reijmer, J.J.G. (1992). Lithological and diagenetic variations across a Lower Jurassic drowning unconformity (Djebel Bou Dahar, Morocco). In: Campbell, A.E. (Ed. ), Unconformities in seismic records and outcrop. Ph.D. Thesis, Vrije Universiteit, Amsterdam, The Netherlands, 91-111. Reijmer, J.J.G., Ten Kate, W.G.H.Z., Sprenger, A. and Schlager, W. (1991). Calciturbidite composition related to the exposure and flooding of a carbonate platform (Triassic, Eastern Alps). Sedimentology, 38, 1059-1074. Glaser, K.G., Reijmer, J.J.G. and Droxler, A.W. (1991). Turbidite occurrence in the Late Quaternary periplatform sediments on the Northeastern Nicaragua Rise. In: Glaser, K.G. (Ed. ), Late Quaternary periplatform sediments and environments on the northeastern Nicaragua Rise, Caribbean Sea. Ph.D. Thesis, Rice University, Houston, Texas, U.S.A., 113-131. Reijmer, J.J.G. and Everaars, J.S.L. (1991). Carbonate platform facies reflected in calciturbidite composition (Triassic, Northern Calcareous Alps, Austria). Facies, 25, 253-278. Kenter, J.A.M., Reymer, J.J.G., van der Straaten, H.C. and Peper, T. (1990). Facies patterns and subsidence history of the Jumilla – Cieza region (SE Spain). Sedimentary Geology, 67, 263-281. Boekschoten, G.J., van der Raad, A.C., Kenter, J.A.M. and Reymer, J.J.G. (1988). Note on a mid-Proterozoic stromatolite, south of Grythyttan, Bergslagen. Geologie en Mijnbouw, 67, 467-469, Bergslagen special. Reymer, J.J.G., Schlager, W. and Droxler, A.W. (1988). ODP Site 632: Pliocene-Pleistocene sedimentation cycles in a Bahamian Basin. In: Austin, J. A., Schlager, W., et al., Proceedings of the Ocean Drilling Program, Scientific Results, 101, Part B, 213-220.